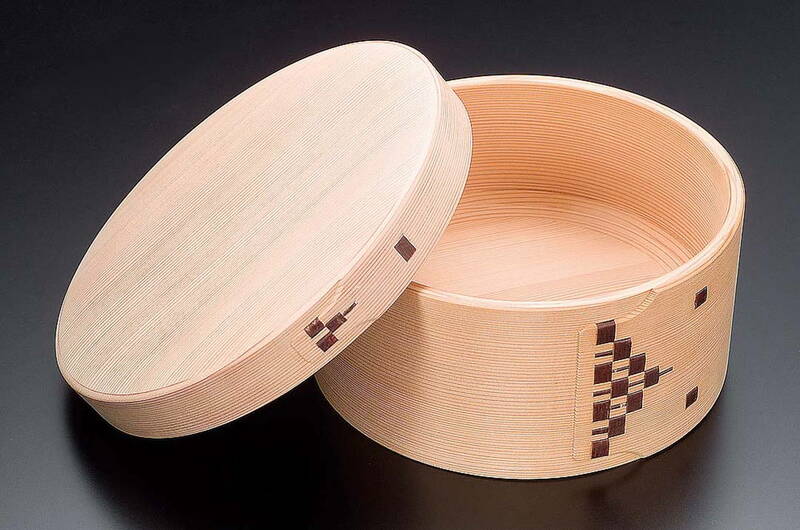 The history of processed cedar bentwood container = Mage-wappa goes far back to the Nara period. In the Odate, bentwood products were manufactured by lower class samurai as their side job about 400 years ago, and earned popularity throughout Japan. Among bentwood products in various places, only the "Odate Mage-wappa" from Odate city of Akita prefecture is designated as a traditional craft of the country. A functional and beautiful container can be considered as a result of traditional technics. 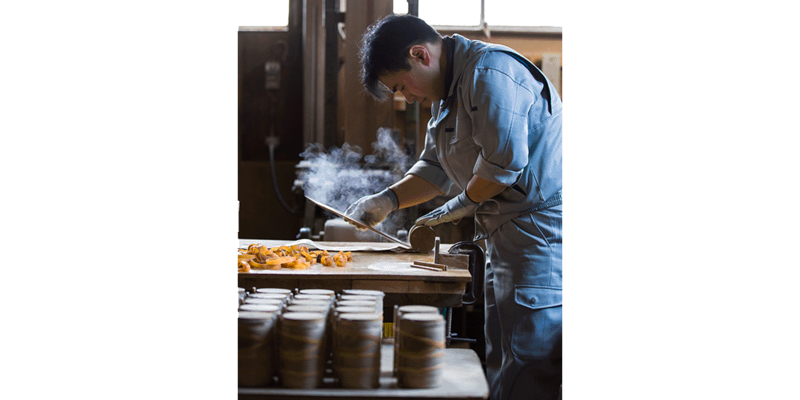 It is a Mage-wappa ohitsu making use of beautiful grains of Akita cedar. It gets rid of extra moisture and heat moderately and makes rice fluffy and delicious. Owing to the moderate humidity control, rice can be deliciously preserved even if it gets cold. Moreover, it has a functional structure with the sloping bottom of the inside to prevent rice from getting stuck in the gap and to make it easy to wash.
A lunch box which is easy to hold and carry, with the image of a mess kit for cooking rice. A gentle curve is a unique characteristic of Mage-wappa. It keeps rice hot longer and also controls moisture moderately because Akita cedar is light and has high moisture retention. It has a perfect function for lunch boxes, including a refreshing fragrance. 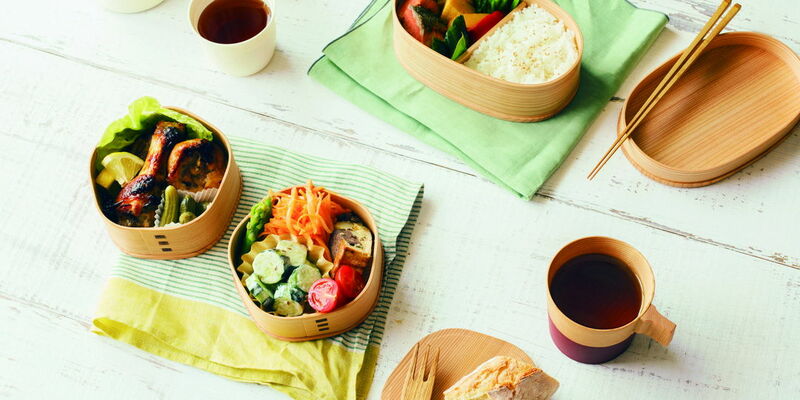 The moment of opening the lid is fun, "Yagura lunch box"
Although the combination of bentwood products and coffee · tea may be surprising, the wood characteristic of not heating or cooling easily is also suitable for cups. Even when hot coffee is poured, the handle is not hot and the coffee keeps the proper temperature. 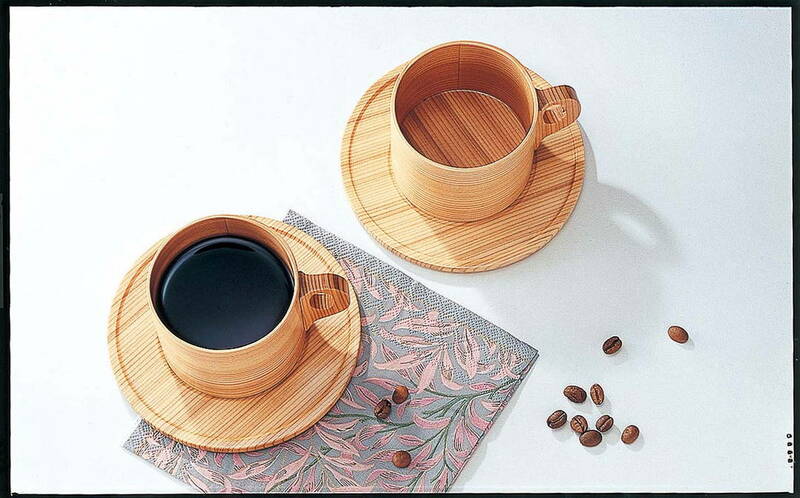 It is a gem with beautiful wood grains of Akita cedar and you will come to love it with use.